Over the years, we’ve received more questions asking where to find a great fitting pair of jeans than almost any other subject. Being a “nontraditional” size means that most clothing on the market isn’t made to fit your body. A pair of Levi’s off the rack might be perfect in the waist, but too tight in the thighs, or too long in the leg. Some of these problems can be dealt with, but wouldn’t it be nice to pick up a pair of jeans that fit perfectly without any alterations? Another company has jumped into the growing arena of online custom clothing retailers specifically to solve this problem: Getwear. 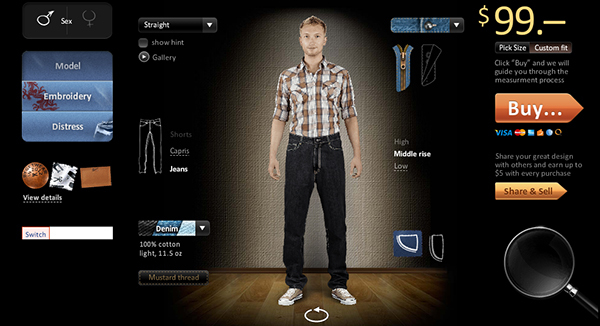 Getwear allows customers to design jeans to their exact specifications, or purchase any of the more than 27,000 designs other users have already created. They pride themselves on the fact that high quality materials are used to construct their jeans, as well as that each pair is made by hand. Hand crafted premium jeans that are impossible to recreate in mass production. We ensure durability with top of the line fabrics, strong seams and high quality buttons and rivets. On top of that, each pair can be customized to your design. Getwear jeans offer bigger folks benefits that aren’t normally found in other brands of jeans, such as premium denim, a reinforced waistband to hold the correct fit, and “Flat Felled” seams, which ensure durability. Bottom line, they’re strong in the places you want them to be, but still comfortable no matter your activity level. If you decide to make your own pair of jeans from scratch, Getwear’s custom design system offers a straightforward process to create exactly what you want. Start with specifics such as fit, denim color and weight, buttons, rise, and more. Once you’ve got the jeans looking exactly the way you wan them to, click “buy” to enter your measurements. Just follow the diagrams and tips to get correct measurements, and then finalize your order. Getwear jeans start at $99 and the price increases depending on what you do to your custom jeans. Learn more and design a pair of your own at getwear.com. Do you own jeans from Getwear? Tell us what you think in the comments below. Movember’s Ending – How Did You Do?